Basic rain gear... 2 piece can leave gap where top meets bottom if jacket is not long to overlap. 1 piece can be better in this regard. Some of the PVC and rubber coated rain gear will trap perspiration inside and make you feel very 'damp.' Frogg Toggs are suppose to breath and pack down small for trips. Goretex or similar riding gear is my preference. I plunked down the $$ for an Aerostich Darien and have never regretted it. Good protection and I never have to stop to don rain gear... as I found out in the past, by the time I stopped to get out the rain gear, I was already wet. I live in South Florida, it's raining now. I have sets of Frogg Toggs on both of my bikes and a set in my car. The are light and breathable. They even make a Hi Viz yellow. My Aerostich Darien jacket and pants are superb but only north of the Mason Dixon line. carry a plastic grocery bag ( insert foot into the grocery bag then easily slide the pants on without removing your boots). THAT IS A GREAT IDEA. 2 piece, Frogg Toggs, haven't let me down. They even have a hood that is thin enough to go under my helmet. Have even used them when suprised with a cold snap, the hood was like having a balaclava. They stay in the saddlebag all the time. I had the TourMaster Elite and was happy with it for a number of years. Then last year during a road trip we ran into rain for a day. Put the suit on and thought I was protected. Found out though that over time the coating on the suit had cracked and separated from the nylon outer shell. A wet crotch is a terrible thing to deal with when riding. I went ahead and spent the extra money to get the TourMaster Sentinel 2 piece suit. I got to try it out today and stayed nice and dry. The suit does not use the moisture proof coating of the other rain suits so I am hoping this investment will last longer than the one for the Elite suit did. This rig does take up more space than the Elite did - two separate storage pouches instead of just one. Isn't that why we have a Connie? Well a C10 anyways. Hows the C14 in weather protection in comparison? ( this is a C14 thread ) For the cooler weather 2 pc First Gear Kilimanjaro Jacket and OverPants. Sometimes in the hot weather I wear the overpants with just shorts and the Mesh Jacket. Other times I wear the Carhart with CE Armor in the Knees and Hips. 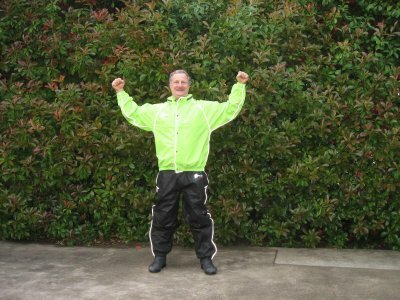 Use Frogg Toggs as rain gear with the Mesh jacket. I recently rode 120mi in the rain on my C10 and this was all the wetter I got. I put a Frogg Togg jacket over the mesh jacket. Too lazy to put pants on. I think with those winter flaps ( fairing extenders ) I dont think I would have even got wet. Gotta love the C10. I use Frog Toggs when I teach MSF class They work very well. The set I have are almost 10 years old. I opted for the angler version to get the bib pants. When on a very wet trip with a friend who wore Frogg Toggs I notices he got wet at the neck line and waist. He wore a 1/2 helmet and ev en though he had the hood up, some driving rain would get in at the front of the neck. At the waist, the jacket was not quite long enough to alway overlap the pants, so rain got in around there. FWIW - Most manufacturers of Cordura or other textile riding gear typically recommend wearing long pants/shirt under the gear. It a get off it is common for the textile fabric to melt and it is a bad ide to have this directly against the skin. I find the thinner rain gear that flaps in the wind to be exhausting for longer rides so I look for something more substantial but this has price/heat drawbacks. I stress the crotch (it's an inseam thing, not a fit thing...) on the one-piece suits so they leak too soon for me. My Fieldshear mesh jacket has a nice fitting rain jacket to go over it that works well and I have some decent bib tops (re-inforced seat, nomex panels for the exhaust pipe) for the hurricanes. Fieldsheer seems to have short sleeves for me but it does have a storage pouch in the back for the rain jacket. I try and keep my Olympia jacket (for the cooler months) waterproof so I just need to carry the bibs. I learned the shopping bag trick when I was too poor and shopping bags were my rainboots! Frogg Toggs has a whole new line of rainsuits. If you haven't looked at them lately, they are vastly improved from the original versions. They now even have a suit in Hi Vis green. The ones I use are the Road Toad and they were specifically designed for motorcycle riders. They also have some new models called Elite Highway, Elite Storm, and Horny Toads that are a bit more pricey ($129) and they also use a different type material that is more like a polyester suit and is even thicker and heavier than the Road Toads. I haven't tried all the other models, so I can really only speak to the original Frogg Togg and the Road Toads. I also don't know if those other materials will breath as well as the Road Toads do. The material on the $69 Road Toads is thicker than the old original Frogg Toggs, and holds up a lot better. I have sets for both my wife and I and we use them alot when we travel. We ride with mesh jackets year round, even in the mountain, and use the Frogg Toggs over the mesh in colder temps to block the airflow. This allows us to travel light with just one set of jackets, and we can ride through Death Valley at 100 degrees and then do the high Sierras the next day at 30 degrees. If it gets cold enough, we put our Gerbing electric vests on under the mesh, and then the Road Toads over the top. This combination allows us to travel anywhere in any temperature or weather, and all we have to pack in the bike when we aren't using them are the Road Toads and Gerbings, which both are light fold up small so they don't take up much space in the bike. This is of particular importance to me when I take off on a three week trip, two-up, as luggage space is at a premium. Last time I checked, they were back ordered on the Hi Vis green until about January. Apparently it was more popular than they anticipated, so they sold out rather fast. I got a set when they first came out, and other than a zipper issue (which they claim is now redesigned with a stronger one), I've been real happy with them. They have offered to exchange my set with zipper problems with a new set as soon as they get the color back in stock, so the warranty service on them seems to be good. Great info Fred, But who is that ugly guy in the picture? HA! Bob - I'm not sure who it is, but it looks like he is telling one of your fishing stories. One thing is for sure. His gear doesn't match. Hi-Viz Frog Togs and plain black Frog-togs? The "Road Toads" come with black pants and Hi Viz top. Only the "Horny Toadz" come with both Hi Viz pants and top. However, with my good looks and charming personality, I'm a little afraid to buy and wear a suit called "Horny Toadz" for fear of being molested by women everywhere I went. As it is, I already have to make myself look ugly before I go to the store just to keep the women from attacking me. And this would be a problem because? I've had the Frogg Togg Pro Action set for about 5 seasons now and they have seen quite a bit of use in some VERY heavy rain. No leaks fit is good and the price is right, $49.00 shipped.